1.Pump up your tyres and keep at the correct pressure. Under inflated tyres can use up to an extra 7% fuel. 2.Check the wheel the wheel alignment as misalignment can cause increased rolling resistance of your car. Therefore increasing your fuel consumption and wearing out your tyres quicker. 3.Remove anything from your car boot that you do not require. For example an extra 30 kg’s adds another 2% to fuel consumption. 4.Remove roof and bike racks etc if not in use as they cause air drag. 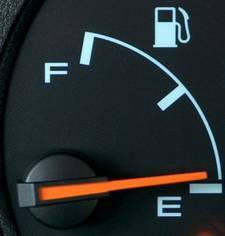 6.Buy premium unleaded fuel only if will benefit the fuel economy of your car as it costs more to buy. Check your owner’s manual to see if your car does actually benefit by using premium fuel. 7.Service your car regularly. For example a clogged air filter can add 10% to your fuel consumption and so can binding brakes or a clogged exhaust system. Regular oil changes with the correct oil will also save fuel as clean oil has better lubricating properties causing less friction in your engine and transmission. 8.Driving smoothly, with as little sudden acceleration or braking as possible, this evens out fuel use and improves the efficiency of your car’s engine. If you change gears at the right time and also do it without strong braking and accelerating, you will save up to about 45% of petrol on the same distances! 9.Shutting all the windows will make your car that bit more aerodynamic. 10. Turning down the Air Conditioning will save fuel as the car does not have to work as hard to maintain a lower temperature. Careful about number 8. All engines are most fuel efficient when running near wide open, at low RPMs. If you have a manual transmission you should accelerate hard, but shift at low RPMs (generally around 2300, but this varies from engine to engine). Owners of automatic transmissions can’t do this, they have to stick with slow accelerations.